I didn’t do it for many years, but during my recent trip in Bali I found myself on a swing again. High above a gorge, right in the middle of the Balinese jungle. For just a few moments I forgot all my worries and felt five years old again. I closed my eyes and was pulled back in time, to the long summers where I used to swing in my parents’ back yard all day long. Careless and free, not even realizing what the world had to offer me. Now, some thirty years later, I went swinging again. You have probably seen them on Facebook or Instagram: pictures of people swinging high above the jungle in Bali. 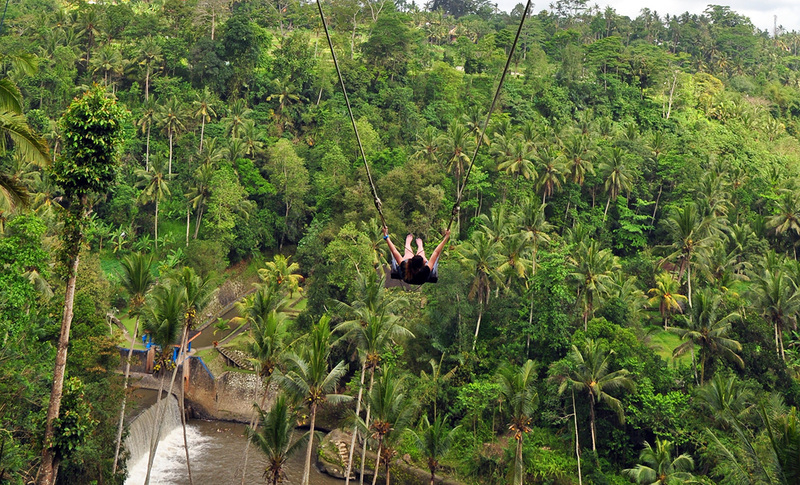 I’ve found quite a few around the island, but Ubud definitely proved to have the best swings in Bali. 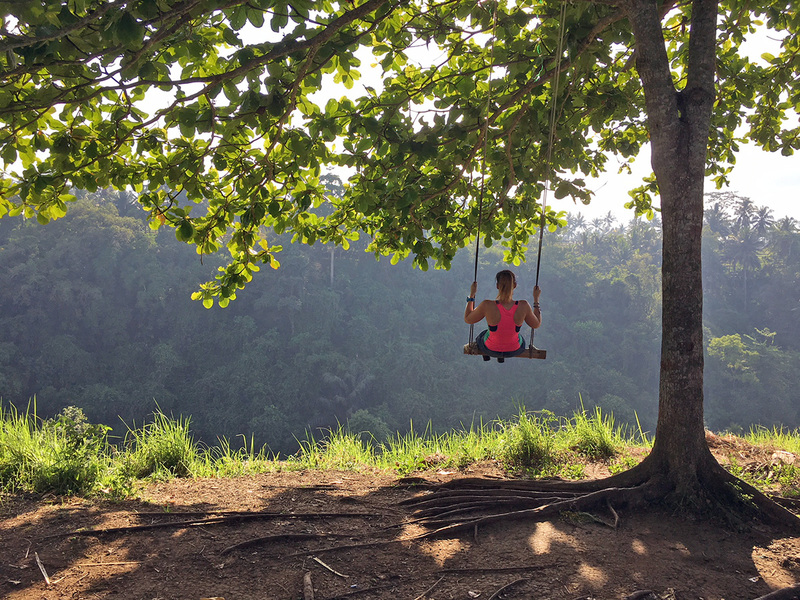 In this blog I’m sharing the best swings in Ubud with you so like me, you can feel young and carefree again, even if it’s just for a very little while. Enjoy! The Campuhan Ridge Walk is a nice and short hike leaving from the centre of Ubud. The walk takes you along the rice fields high above the city and gives you simply stunning views of the area around Ubud. With a bit of luck, you can even see as far as the Agung volcano in the distance. After a few kilometers you will find a swing on your right hand side. It’s an amazing spot to sit down for a while and enjoy the piece and quiet that you will find on this trail. The hike is not too hard and can be done by anyone, however note that it’s best done in the early morning as it can get quite hot and humid out in the sun. You can find all you need to know about this walk in my Campuhan Ridge Walk blog. 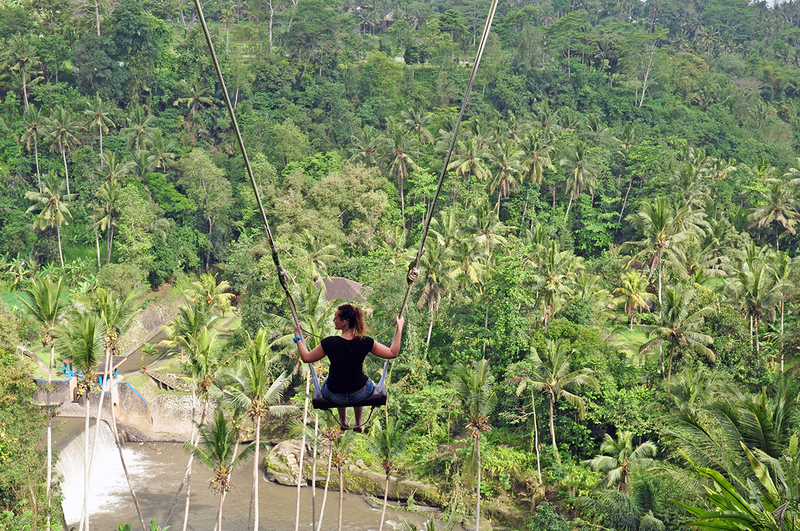 Another one of the best swings in Ubud can be found at the Tegalalang rice fields. These are among the most famous rice fields near Ubud and despite the crowds, are truly worth a visit. From Ubud you can take a taxi for the 30 minute drive and most drivers will wait for you to finish your visit, so there’s no need to bargain for a ride back to town. You’ll need to pay a small admission fee upon arrival and can make a donation for the Tegalalang swing which I did of course. The Balinese are definitely the friendliest people I’ve met and they deserve the money more than anyone else. 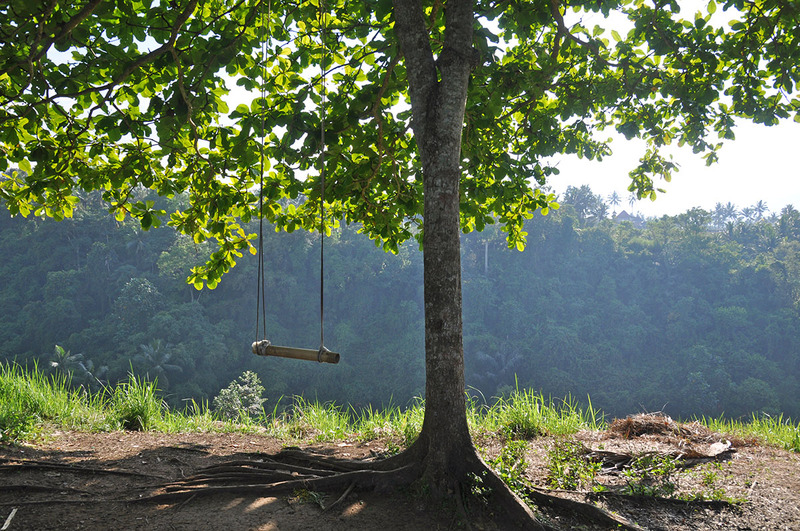 On top of my list of best swings in Ubud is the Bali Swing. This is an official site which you have to pay an entrance for, but the feeling in your stomach when you are released and are swinging down into the jungle is simply amazing. All swings at the Bali Swing are secured (take a closer look at my pictures!) so they are completely safe and I never felt unsafe at any point. You don’t really have to do anything yourself as you are being pushed, which makes it quite a relaxing afternoon out. 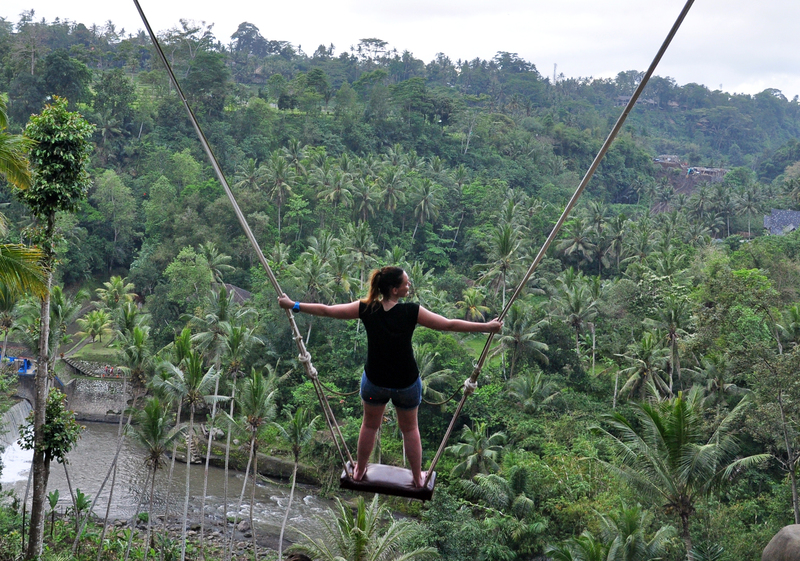 A total must-do when you are in Ubud! You can read my full story in my Bali Swing blog. Planning to overnight in Ubud? I often get asked questions about a hotel with infinity pool in Ubud. I researched the cheapest option and found Pertiwi Bisma II, which I booked for some € 30 per night. At the end of my Indonesia trip I returned to Ubud and stayed at Anini Raki Hotel & Spa, another amazing hotels located right between the rice fields. I paid € 25 per night for Anini Raki. Go here for a full list of my favorite hotels in Ubud. I flew to Bali with Qatar Airways, an excellent airline. I booked my flight from Amsterdam to Denpasar about a month before departure and paid some € 600 for a return flight, with a short stop in Doha along the way. 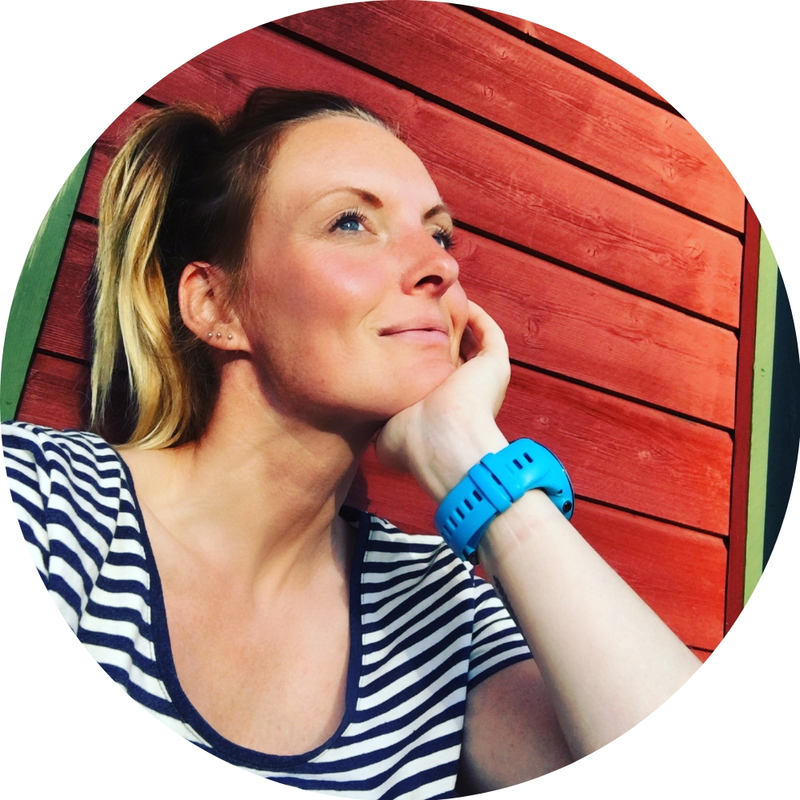 I always book my flights on Skyscanner ! Also make sure not to forget to order your copy of Lonely Planet for a complete overview of things to do in Ubud and around. I love this post! We are planning a visit to Bali next year and will definitely be saving this for reference. Thanks for sharing! Thanks, happy to hear and have a great time in Bali, you’ll love it! I always felt it was 1 swing. How cool. Good to know we’ve a few IG options out there, although methinks this is more for women bloggers and not guys LOL. Tweeted for you.